Earl W. Poling, Seaman 1/c, born Feb. 17, 1924, Wood County, WV. 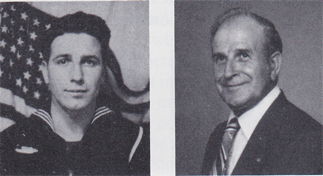 Joined the USNR April 16, 1943, and was stationed at Great Lakes NTC. Memorable experience was being trainer on #3 turret 16" gun. Discharged Jan. 29, 1946, as S 1/c. His awards include the American Theater, Asiatic-Pacific and Philippine Liberation. Married Florence and they live in Washington, WV. They have two children and two grandchildren. Employed 39 years with O. Ames Assembly. Hobbies are golfing and bowling.